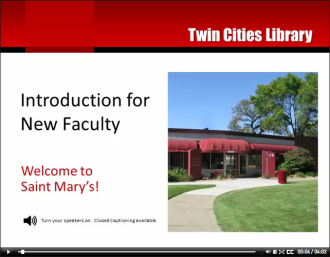 Twin Cities librarians are here to support your teaching experience at Saint Mary's! We offer numerous services just for faculty. Read about them below, and learn how we can make your teaching experience easier. Watch this short video to learn about the library, staff, and how we can help you and your students. Get an overview of copyright in academia, answers to frequently asked copyright questions, and copyright and Blackboard / Engage scenarios. Learn how to find, request, and reserve materials for yourself or your students. Enhance course content by embedding library articles, eBooks, and videos into Blackboard or Engage for your students to view anytime, anywhere. Faculty aren't automatically issued ID cards, but you can request one! Learn about the various ways your students can learn how to locate, evaluate, and use information.